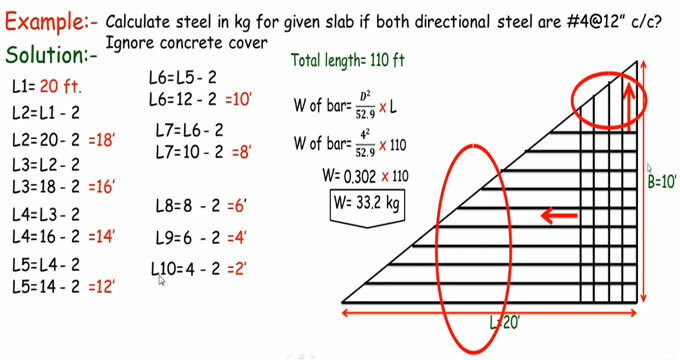 In this construction video tutorial, you can find the detailed process for estimating steel for the slabs which are constructed in triangular shapes. The process is simple and straight forward. Initially you have to discover the cutting length for each bar and then total weight of bars necessary for triangular slab. There are six types of triangles. On the basis of sides, the triangles range from Scalene, Isosceles, Equilateral and on the basis of angles the triangles range from Acute, Right and Obtuse. In this video right angle triangle is taken. Estimation will be dependent on the design of the structure for which load and moment functioning on the structure are taken into consideration. Compute steel in kg for provided slab when both directional steel are #4@12” c/c. Don’t consider concrete cover. To learn the process in detail, watch the following video.